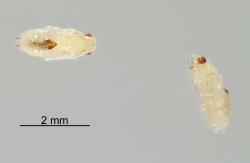 The parasitoid of Turnip leafminer, Scaptomyza flava (Diptera: Drosophilidae), was originally believed to be Asobara persimilis (Prince, 1976) (Hymenoptera: Braconidae). 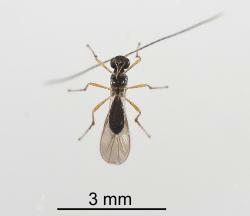 However, the limited geographic distribution parasitoids reared from Scaptomyza flava raised doubts about its identity. 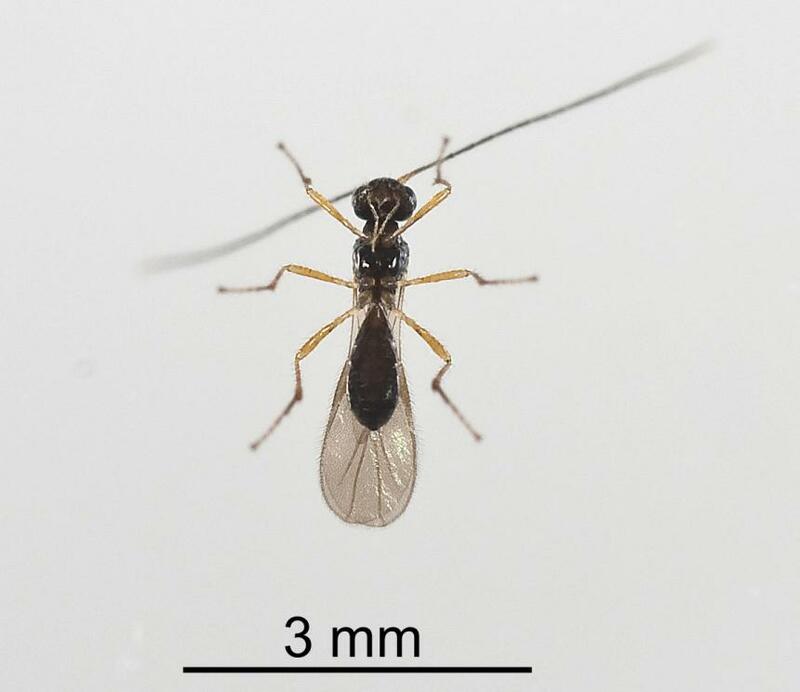 Analysis of the DNA of the parasitoids reared from Scaptomyza flava in New Zealand, showed that it may be a separate species close to Asobara persimilis (Jacques van Alphen, University of Leiden, The Netherlands (22 June 2010)). This adventive wasp may have been first reared from the Turnip leafminer, Scaptomyza flava (Diptera: Drosophilidae), in 1973, in Mount Albert, Auckland. Then in December 2000 it was reared from this host in the Pukekohe area of South Auckland and has been reared regularly from flies in this small area. Some have been released in the South Island, but it is not known to have established. Conservation status: The wasp parasitoid is only known to be in the Pukekohe area of South Auckland. It does not harm native species. The only known host of this parasitoid is the turnip leafminer, Scaptomyza flava (Diptera: Drosophilidae). Both the fly and wasp breed throughout the year in Auckland. The wasp can achieve over 80% parasitism of the fly pupae in the summer. The adult wasp’s body is about 2 mm long, from head to wing tip is about 3 mm. The body is brown to brownish black. 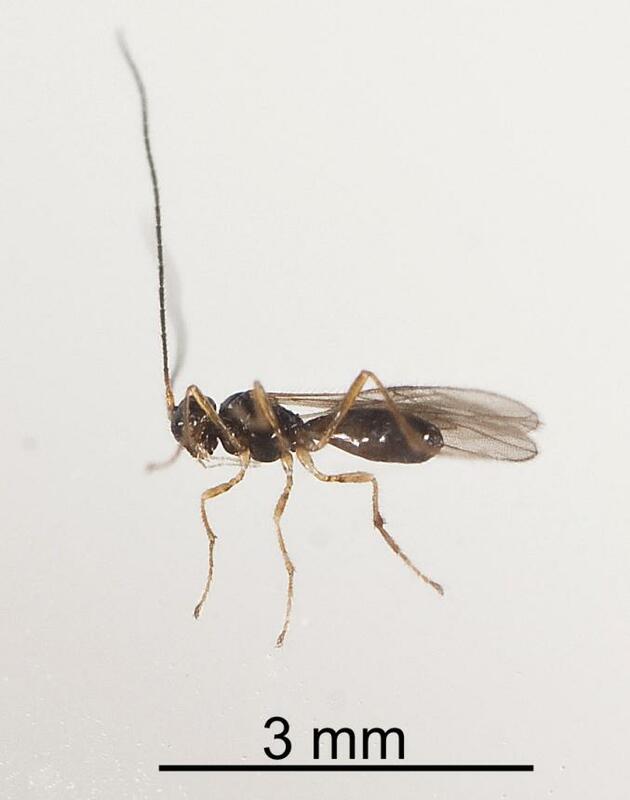 They have three pairs of long brown legs and antennae that are longer than the body. The beginning of the abdomen is narrow. 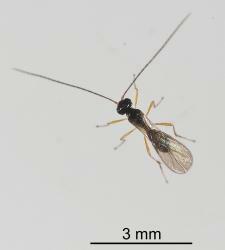 The female has a long ovipositor, while the male has a rounded end to the abdomen. The adult female wasp locates a fly larva in a leaf mine and uses her long ovipositor to lay an egg in the larva. 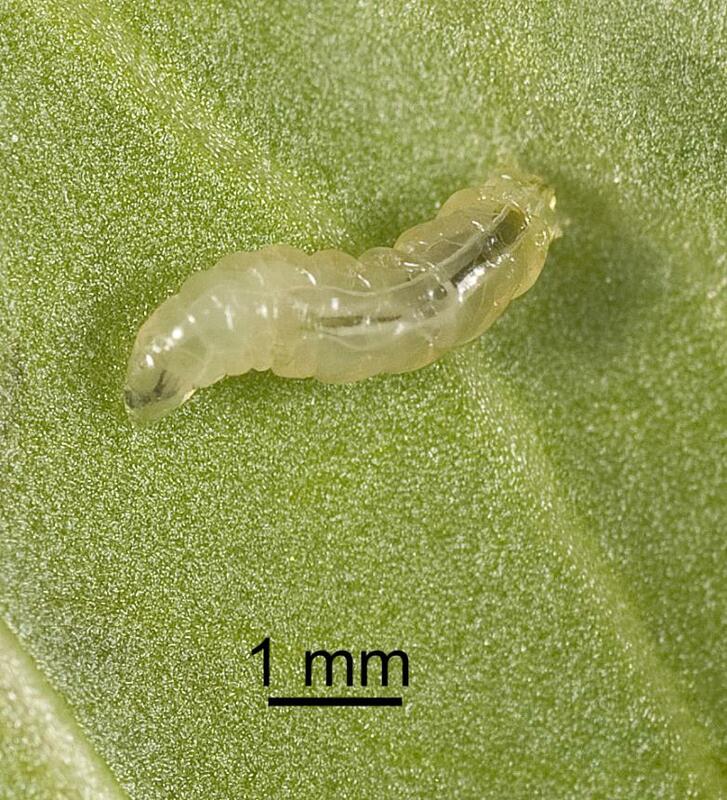 After hatching from the egg, the larva grows in the fly larva until the fly larva is full grown, has left the leaf and pupated in the larval skin which turns brown and is now called a puparium. The wasp larva is full of white structures and can be seen dissected puparia. 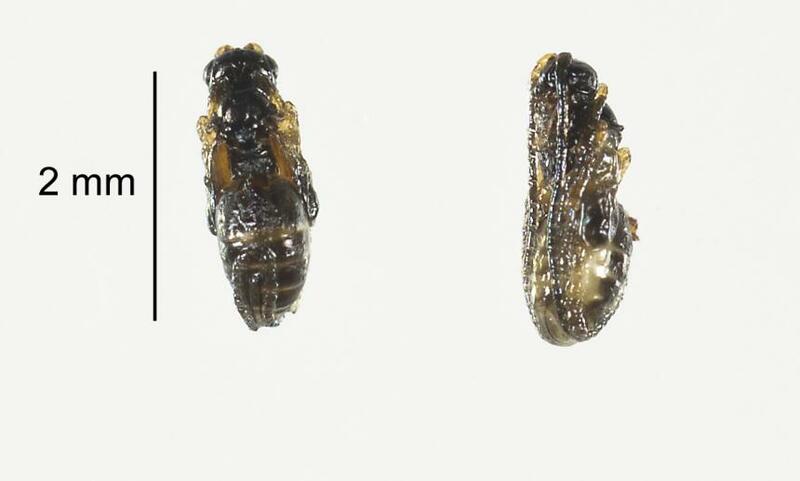 The fly pupa is killed by the wasp which itself pupates in the fly puparium. 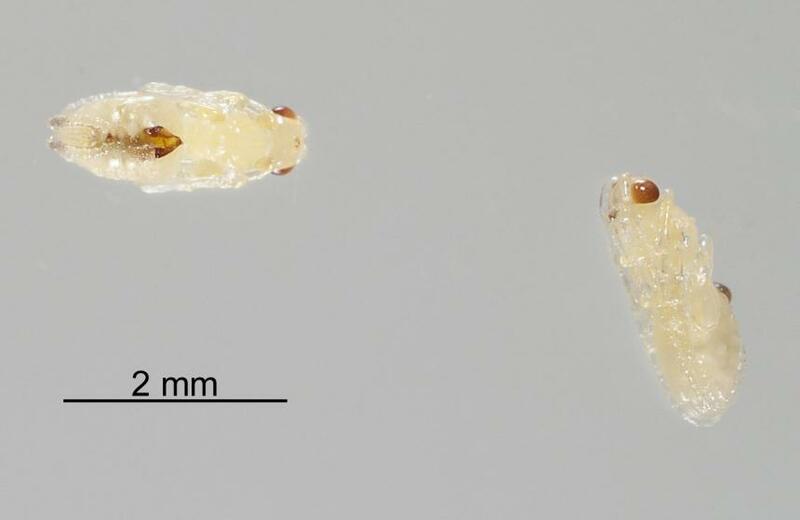 The wasp pupa has wing buds and the outlines of the legs and antennae. The latter coil round to the dorsal side of the abdomen. 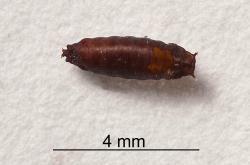 When the adult has emerged from the pupa and its body hardened, it chews a hole in the puparium and emerges. No pathogens, parasitoids or predators of Asobara sp. near persimilis are known in New Zealand. The adults are probably caught by predatory insects, spiders and birds. The only known host of this parasitoid is the turnip leafminer, Scaptomyza flava (Diptera: Drosophilidae). The adult female wasp locates a larva in a leaf mine and uses her long ovipositor to lay an egg in the larva. 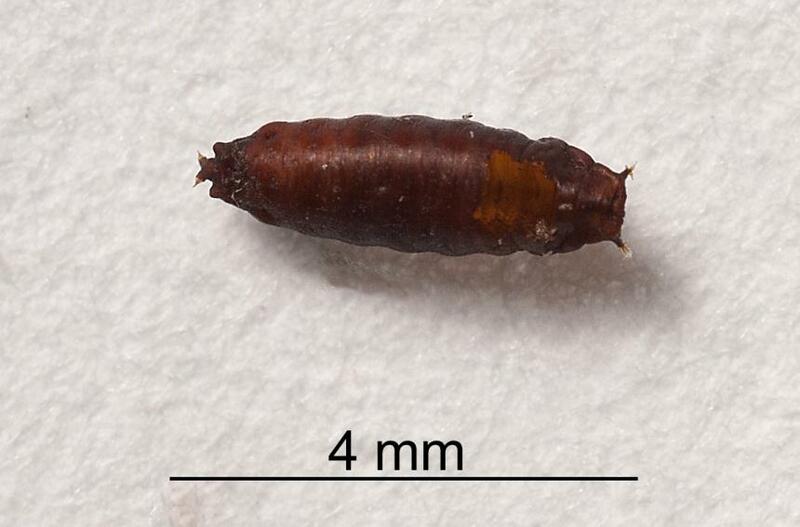 After hatching from the egg, the larva grows in the fly larva until the fly is full grown, has left the leaf and pupated in the larval skin which turns brown and is now called a puparium. 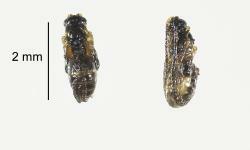 The fly pupa is killed by the wasp which itself pupates in the fly puparium. 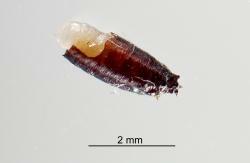 When the adult has emerged from the pupa and its body hardened, it chews a hole in the puparium and emerges. The wasp can achieve over 80% parasitism of the fly pupae in the summer. The Turnip leafminer parasitoid, Asobara sp. near persimilis can parasitise over 80% of Turnip leafminer pupae in mid summer and substantially reduce pest populations. However, on some leaf vegetables and seedlings the parasitoid does not prevent unacceptable damage. Ideally when insecticides are used they should not harm the parasitoid. Some insecticides have been tested and some parasitoids survived the applications. This can potentially reduce the need for insecticdes on these crops and allow biological control of the turnip leaminer and other pests of these crops. 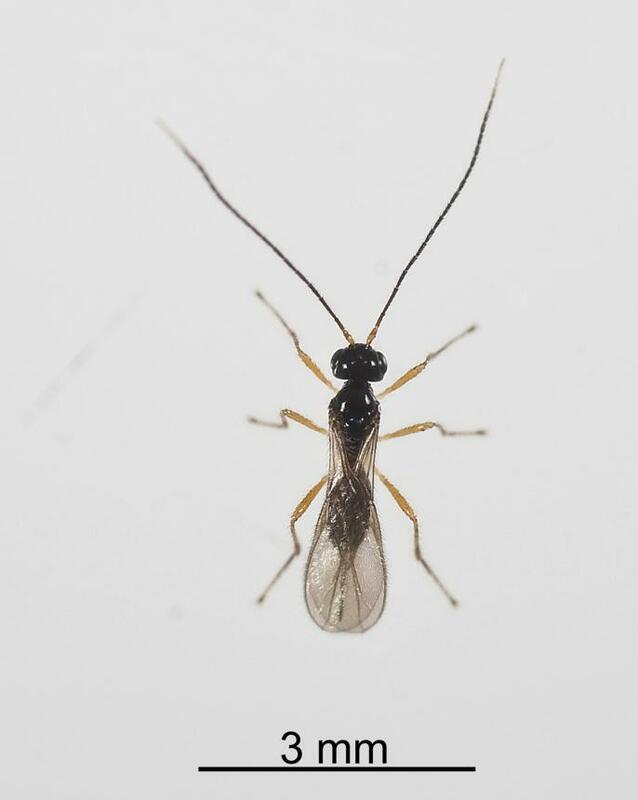 Morphologically this parasitoid appears to be Asobara persimilis (Prince, 1976) (Hymenoptera: Braconidae), but a number of aspects of its biology raised questions about its identity. Asobara persimilis is found in Australia and New Zealand. 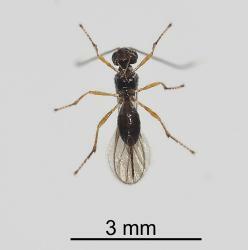 Its hosts include adventive Drosophila species and Scaptomyza (Bunostoma) species in both countries. 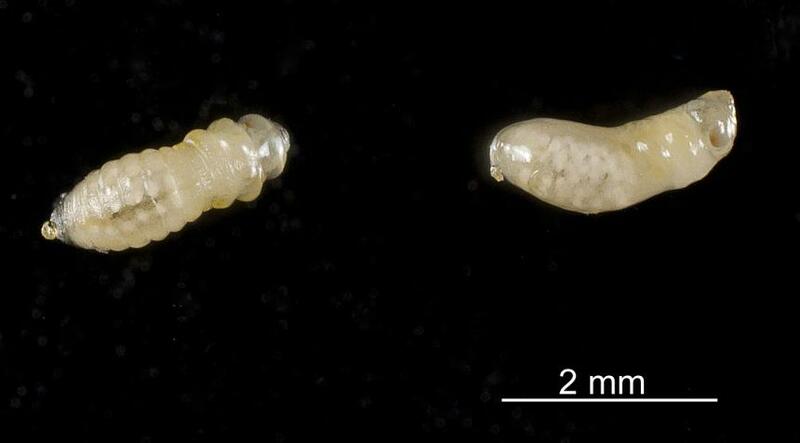 The larvae of the Drosophila species are associated with decaying fruit while the larvae of the two Scaptomyza (Bunostoma) species feed on decaying leaves, though the unnamed New Zealand species also feeds as a leaf miner in live leaves. The Turnip leafminer, Scaptomyza (Scaptomyza) flava (Fallen, 1823) is a true leaf miner from Europe and is in a different subgenus to the Australasian species of Scaptomyza. 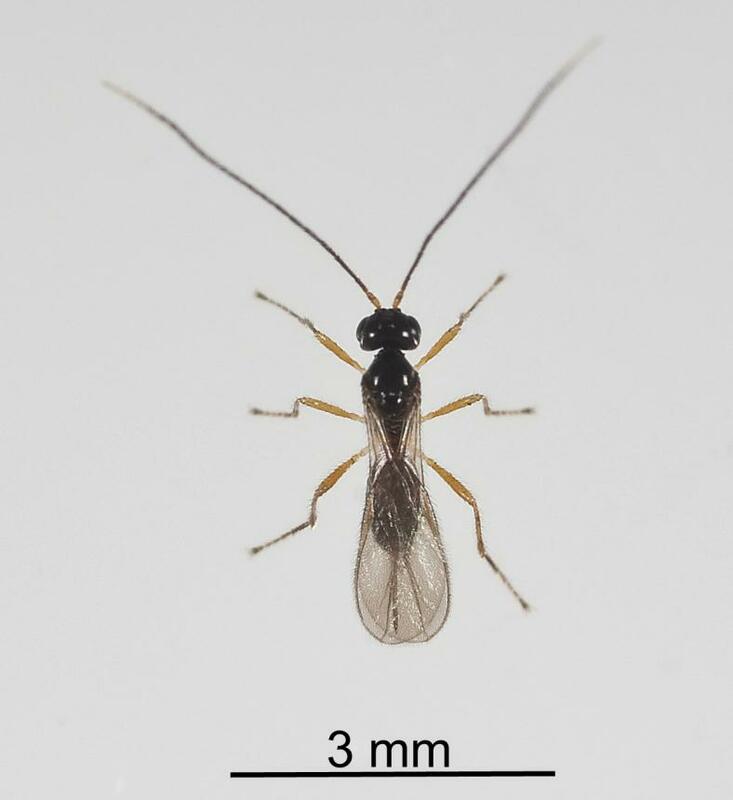 Asobara persimilis is found throughout New Zealand, whereas the Asobara wasps that parasitize the Turnip leafminer are only found in a small area near Pukekohe in South Auckland. The only exception are 2 males reared in 1973 from leaf mines in Raphanus maritimus at Mount Albert, Auckland City. 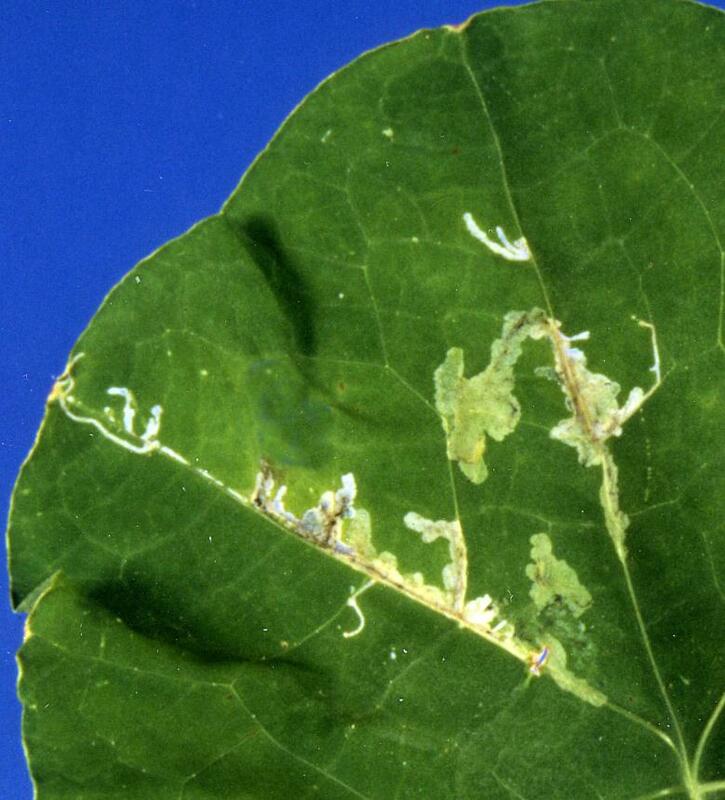 This restricted distribution of parasitism of Turnip leafminer first raised doubts about the parasitoids identity. Reared specimens were sent for DNA analysis to Jacques van Alphen, University of Leiden, The Netherlands who concluded that it may be a separate species close to Asobara persimilis (22 June 2010). Asobara reared from the Turnip leafminer, Scaptomyza flava (Diptera: Drosophilidae) may be a distinct species or a host race of Asobara persimilis. The recent discovery of Asobara persimilis parasitising a native Scaptomyza (Bunostoma) species that is both a true leaf miner and can live in decaying leaves, supports the idea that Asobara persimilis may have host races, one of which can locate and lay eggs in fly larvae that live in live leaves. 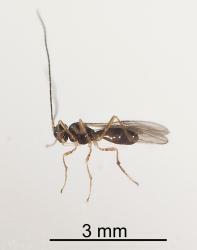 In order to clarify the status of the different populations of this wasp, further evidence is needed about its geographical distribution and its host range. There needs to be extensive collections of the Turnip leafminer and rearing of its parasitoids from many parts of the North Island of New Zealand. Also experiments should be conducted with populations of Asobara reared from Scaptomyza flava, to see if they will parasitize Drosophila species that live in rotten fruit and Scaptomyza (Bunostoma) species that live in decaying and live leaves. Collections of Asobara ‘persimilis’ from endemic Scaptomyza and Drosophila would also be helpful. Berry JA. 2007. Alysiinae (Insecta: Hymenoptera: Braconidae). Fauna of New Zealand. 58: 1-90. Martin NA. 2004. History of an invader, Scaptomyza flava (Fallen, 1823) (Diptera: Drosophilidae). New Zealand Journal of Zoology. 31 (1): 27-32. Martin NA. 2012. Ecological studies of Scaptomyza flava (Fallen, 1823) (Diptera: Drosophilidae) and its parasitoids. New Zealand Entomologist. 35: 58-67. Martin N, MacDonald F. 2009. Evaluating the impact of insecticides on Scaptomyza flava and its parasitoid, Asobara persimilis. New Zealand Journal of Crop and Horticultural Science. 37: 243-252. Martin NA. 2017. Turnip leafminer parasitoid - Asobara sp. near persimilis. Interesting Insects and other Invertebrates. New Zealand Arthropod Factsheet Series Number 93. http://nzacfactsheets.landcareresearch.co.nz/Index.html. Date Accessed. ISSN 1179-643X.